Mitch, first of all congratulations on your Worlds Title 2015 on the Hobie Wild Cat. This was really a great thing winning it with Ruben. Very well done. This to me shows how you are living the Hobie Way of Life truely in a Hobie family. Another great thing was your outstanding performance at the F18 Worlds in Kiel; it showed that the Wild Cat is still able to outrace all other designs – a job very well done by you and Ruben. What makes you stick to Hobie? Having met you in Kiel, it was mainly lighter winds and some swell. Would you be so kind and explain us a bit on how you were tuning the Wild Thing (aka Hobie Wild Cat)? MB We really didn’t have much time prior to the regatta to train, only one day. The boat was setup with everything in the middle. Meaning mast rake mid, diamonds mid spreaders mid and nothing special. How do you push your boat through the chop? MB It is very important in the light and choppy conditions to sail in clear wind and not disturbed from other boats. Its also critical to sail a free and twist mode to keep max boat speed and not focus on height. 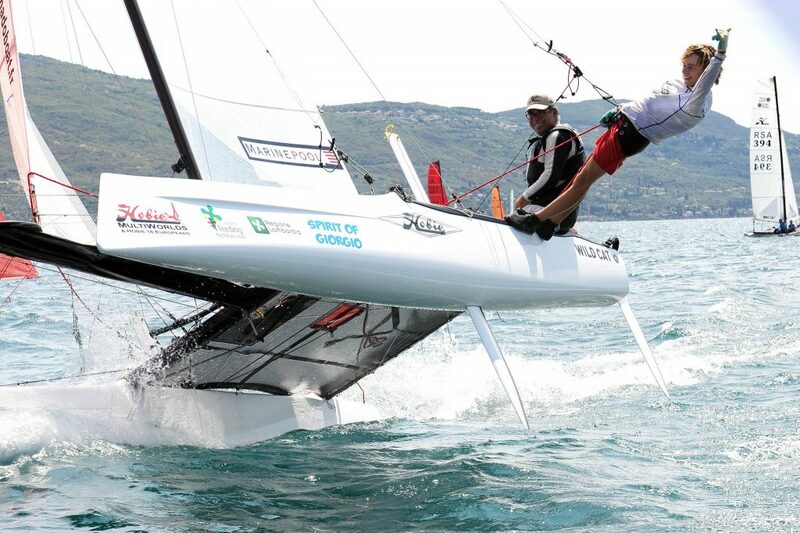 With so many new classes like Nacra 17, F16, Nacra 16, foiling cats etc. what do you think or recommend the Hobie class should pursue in the future? MB I don’t know what Hobies plan is for future classes or designs, but there is a trend towards higher performance beach cats in general. I hope Hobie continue to be a brand pursuing the leading edge of our sport. With respect to my last question, what is your recommendation to ISAF? Personally, I am really missing a master plan, as we are seeing changes in i.e. Youth Boats almost every time ISAF meets. This really makes it difficult for nations to cope with. MB ISAF have many political pressures to push the sport in different directions. I think its important to create the boats that the sailors want and then they will in turn pursue ISAF for use or recognition in the right place , either Youth Worlds, Olympics, etc. I realised some changes at your Wild Cat in Kiel – i.e. you had extra holes drilled in your daggers. Could you explain to us how you use those? MB The holes in our daggerboards where simply to place a rope as a stopper so when we flew a hull it didn’t drop too far down in stronger wind. Besides this which upgrades/ improvements do you recommend for the Wild Cat? During pre-start procedures, how do you prevent that you are drifting leewards towards other boat designs with different underwater shapes? MB Side drift is controlled by sail trim and speed. This is something that can be practiced and help with good starts. This has very little to do with hull shapes. Which do you do first: reduce mast rotation or increase cunningham tension? MB Always cunningham. Mast rotation is only when at end of cunningham range. Do you have pointing problems in comparison to other boat designs? If so, what is your solution? MB Not in light to medium wind… in fact the Wild cat points higher than most other F18’s in lighter conditions. This is mostly due to the daggerboards. Stronger wind is a bit harder but its most important to remember speed creates lift from the foils, so its important to always keep fast. A couple of years ago in Dec. 2004 we prepared a tuning table with you for the Tiger. If you don´t mind, please give us your recommendations for the Wild Cat. MB You may think it strange, but I rarely work with numbers and always tune the boat according to sail look, helm feel, charictaristics of how the boat feels and sails. Only then do I go and check what the settings are so I can have reference for next time I rig. To be completly honest, I have no idea what numbers we used in the last regatta’s . All I can tell you is Ruben and I were 143 kg and very fast in under 12 knots. Before we are closing, may I ask, which are your plans for the EXTREME SAILING series? Mitch, thanks a lot for your time and the information you have provided. Hope to see you next year back in Germany and please say hi to your family! Best regards and have a Hobie day!